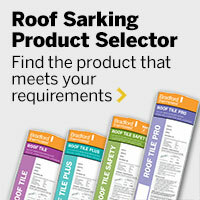 Sarking is a pliable membrane that sits under your roof tiles, like a protective second skin. It helps insulation work more efficiently, and protects the things you value from storm driven rain and dust, condensation and bush fire ember attack. Sarking is a pliable membrane that sits under your roof - like a protective second skin. Sarking under metal roofs can improve thermal performance in warmer climates. Find out which product is right for your home. Roof sarking is a protective second skin under your roof, installed when building a house, doing home extensions, a home renovation or roof restoration. Roof sarking is a pliable laminated membrane that is positioned under your roof during installation by the builder and is rolled out in sections either parallel or perpendicular to the eaves with an overlap between each layer. Roof sarking will protect the frame of your house from the weather during construction. When your home is completed, sarking will protect your roof cavity from storm driven rain and dust, improve its thermal performance, help it resist bushfire ember attack and reduce the risk of harmful condensation. Thermoseal reflective foil roof sarking is a non-permeable, vapour barrier product designed to reduce the transmission of moisture into the home and contribute a reflective air gap R-Value to the roof system when positioned to adjacent to an inward or outward facing air cavity. Protects the building frame from decay by reducing the entry of wind driven rain and dust. *If the membrane is to provide a continuous vapour barrier, all joins, penetrations and discontinuities should be sealed. A simple way to understand how reflective foil laminate membranes like Thermoseal work, is to compare them to a survival blanket. The silver foil blanket helps regulate temperature, whilst at the same time providing protection from hot or cold weather, particularly where additional protection from wind and rain is also required. Likewise, reflective foil sarking products can shield up to 95% of radiant heat away from the roof cavity space. Thermoseal works under your roof tiles, like a protective second skin, helping make your home more comfortable and protecting the things you value from the weather.